Great virtual reality (VR) experiences are expensive. You're either paying more than $1,000 for a complete setup, or you're dropping $20 on a ticket to get a chance to fly like an eagle for five minutes. Sure some VR headsets are adequate, and affordable, but they're hardly immersive VR. They're novelties — not necessities. 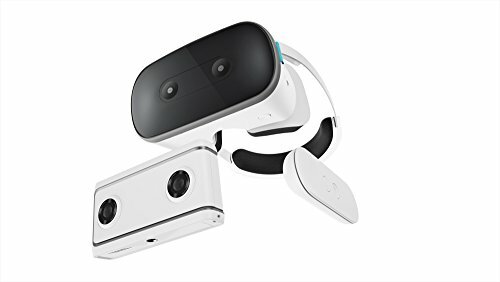 Lenovo Mirage Solo may change that, the device that finally brings robust virtual reality into the home. 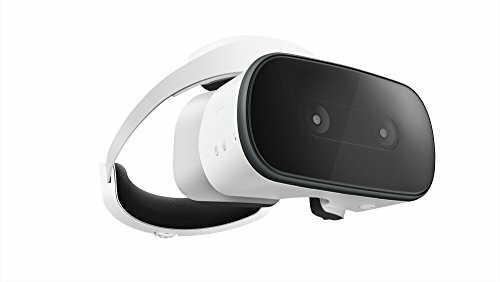 Launching today, the $399 Lenovo Mirage Solo is a clean, well-designed, virtual reality headset that's could be the bridge to really getting VR into people's hands. It's the first standalone VR headset with Daydream, Google's virtual reality system, and at launch brings hundreds of titles right into the device. After spending some time playing games, walking through cities, and swimming with a sea otter or two in VR, I can also say it's the first VR high-end headset I could imagine buying for myself, even if the price tag is still a bit hefty. I'm going to come clean and say I did not find it completely intuitive to get into the device. There are three buttons on the controller: one larger touchpad, the app button and the Daydream button which acts as a main menu controller. The touchpad launches and connects to Wi-Fi, and I had to return to that feature twice. The first time the keypad to enter my Wi-Fi password didn't show up for me. So I turned the device off, back on, and was able to log on then. But then, that was it — I was in. I had to recenter a couple of times so the screen was level with my frame of view, and honestly that took just a few seconds. There are 350 Daydream apps available at launch, including "Planetarium VR," "YouTube VR," "Google Street View" which took me to Buenos Aires and Disney World (among other spots), and an arts VR app which let me stroll through images from art institutions including the J. Paul Getty Museums. About 70 of these are updated with WorldSense capability — which allows you to move around with six degrees of freedom: ducking, dodging, as well as walking, for example. In the games updated for WorldSense, you can tell the difference. "BBC Earth: Life in VR" took me to the California Coast into an animated swim with sea otters, near a coast line that looked like I was near Long Beach. The experience was lovely, and certainly would have an appeal to children. "Bladerunner: Revelations" is a quest game where you try to solve a crime as you search for a replicant in the dystopian landscape of Los Angeles in 2023. This was the one game where I had a glitch. About 10 minutes into the game, the screen broke into pieces, with diagonal lines, until everything went dark with a warning that I needed to recenter. To be fair, I stopped the game by just removing my headset, putting it back on about 20 minutes later, and then starting up again. It's also the only game where I felt the slightest tinge of dizziness, which happened as I started flying: I am, though, afraid of heights. The "Merry Snowballs" game turned into my favorite — a chance to get some aggression out by hitting smirking, cartoon kids in the face with snowballs. A grumpy Santa appears as well, giving you pointers and extra skills. I tend to get motion sickness from VR headsets — Cardboard, and higher end models included. That didn't happen to me with the Mirage Solo. I only figured that out after 12 minutes passed while shooting snowballs from a snow gun. Someone tapped me on the shoulder trying to get my attention, I jumped, snapped at the interruption and got pelted in the face in the game. Only then did I realize I had spent longer in a VR experience than I ever had before, without experiencing any issues. Lenovo wants you to think of the Mirage Solo like a tablet: you need to log into your Google account to download experiences from the Google Play Store. You can still, though, share the headset — anyone can play the games, just as anyone can get on the web from a tablet's browser, and people can access Google Photos from inside the headset, switching in and out of different accounts. Just be aware that anything you shoot and store is saved to one Google account: just something to note if you're buying one for a classroom, household or family. Screenshots and video capture is also possible from inside Mirage Solo, and you can also cast what you're seeing to a Chromecast-compatible device. Mirage Solo felt very comfortable, weighing just 1.4 pounds. That's a big point as most Cardboard headsets can end up extremely front heavy once you pop in a smartphone. You tighten the headset with a large dial in the back, standard for most high end VR headsets. At first, because of the lack of tethering, without a wire limiting my movements too far from a computer, I was a bit concerned I would trip over things around me. But I didn't trip, and honestly the screen went gray when I went too far beyond the edges (like trying to touch a sea otter: they are cute) similar to most virtual reality experiences. Once thing to note: the headset was not great for small heads. I took the device home, and put it on my 15-year-old. Even on the tightest setting, she found it slipping a bit. She's a petite one, but this points to something thinking about if you're considering the Mirage Solo for children. The screen itself has a 110-degree field of view, and can show up to 16.7 million colors, and the battery is meant to hold a charge for about three hours. The front of the screen got pretty warm after about 10 minutes of continuous play — but I never felt it, only noticing when I took the Mirage Solo off my head. Vents around the headset actually keep your face cool while you use the device — even on the hottest day this spring so far, in a room not air conditioned, I was fine. Mirage Solo doesn't come with headphones, and you'll want those for the best experience. True, there really isn't a smartphone owner around who doesn't have a set of headphones — but I have an iPhone X. My headphones have a lightning jack at the end. The Mirage needs headphones with a traditional jack. I dug up a pair of Beats which worked fine. Still, for $399, it would be nice if they threw in a cheap pair of headphones. Adoption of virtual reality — good virtual reality — has been hampered primarily because of price. You need the headset, which even at the lower end is still priced at close to $500. Then you needed a solid gaming computer — another $500 to $700. That definitely puts a crimp in consumer pricing for a product most still see as a novelty item. Lenovo's Mirage Solo could be the anecdote to this issue. But it's got a problem of its own: Oculus Go, the untethered VR headset coming from Oculus, priced at $199, with access to Steam's library, which for serious gamers is hard to combat. Mirage Solo's dovetail with the Google ecosystem (a big plus for those in education) and Daydream VR, however, makes it a competitive option — and an excellent one to consider.